I recently stumbled across another enthusiast of the Connie, a former charter pilot who also used to admire the Pearson Connie on his way to work as a corporate pilot. Jeff is by all indications, a Connie aficionado and had I known I was bidding against him in an attempt to win a Connie ashtray a few weeks ago, I would have thrown in the towel right away. In Jeff's words, "I have travel agency models, desktop models, Corgi and Dinky models, paper ads, manuals etc. I've been aboard the Breitling Connie, and, when I was a kid, I was onboard the Super Connie that is in the Museum of Flight in Seattle." Anyone with a photo I can post here of the Pearson Connie can contact me at ed.das@rogers.com. A nice TWA Connie shot at Oshkosh. 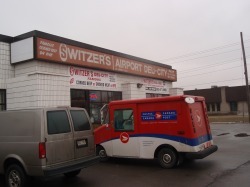 If you do happen to be around the industrial area on the north side of Pearson airport, you'll want to know about Switzer's which I will attest to having the best deli sandwiches in Ontario. Take Derry Road to Torbram, hang a left and go down a few kilometeres until you see it on your left in an old strip plaza-everything else has gone bankrupt in the plaza but Switzers remains and continues to serve up great deli sandwiches. It is ironic that you have a blurb about Switzer's on this page. I couldn't guess within a hundred how many sandwiched\s I bought there in the 70's and 80's. The most interesting recollection of Switzer's and TIA has to do with my own restoration of an aircraft, but not for a museum, but to put back into service. I purchased a wrecked DC-3 (C-47) from EPA back in the mid 70's. They ground looped it up in St Anthony's Newfoundland in the middle of winter. We trucked up a couple of engines from Gander, and hung the engines in 30 below zero weather. After about 10 days, and with a limited ferry permit, we flew the Gooney down to Gander at about 85k IAS. There was a huge gapping hole in the radome, and we could not fly much faster without risking tearing off any more of the skin on the nose. Also, the landing gear was bolted in the down position for the ferry flight. After about 2 months of extensive repair, I brought the aircraft (CF-RTY) to Toronto where I made it available for charter. Two parachuting clubs were my best customers. Every Friday in the nice weather, I flew to Gananoque with the clubs. They loved the Gooney because of the double cargo doors, and 30 jumper capacity, great for formation jumping. The following year I sold the plane to Tropic Air in Barbados. On the way to delivery the aircraft, we stopped at a grass strip in S. Carolina that converted a barn to an aircraft paint shop. After what had to be the fastest paint job every, we took off again, paint still drying, for the Caribbean. This was one of my most interesting adventures involving a vintage classic airplane. While in my possession, which was about 14 months, I was wined and dined by Eastern Provincial Airways, spent my weekends with the Ontario Sport Parachuters Assoc., and lastly enjoyed a wonderful VIP stay in Barbados coutesy of Tropic Air. 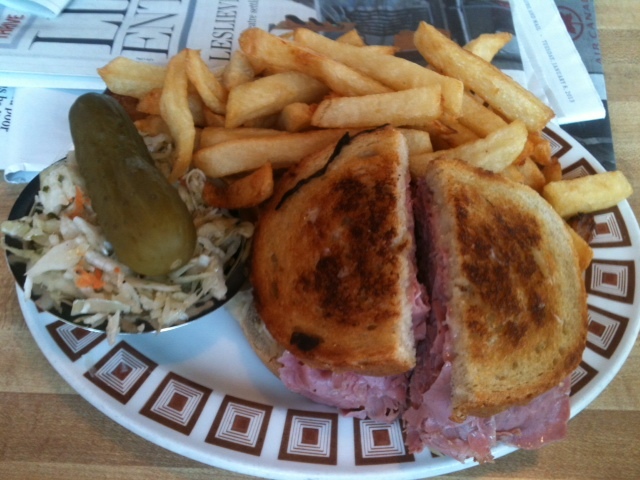 A Switzers Reuben. a little pricey at over $18 with a Coke, but very tasty.